I am completely incapable of resisting postcard books. Years ago, a book called Mommy, It’s a Renoir! suggested you introduce art to children with art postcards. And that was all the justification/rationalization I needed. One of the secret benefits to bibliophiles who homeschool is that an indulgence can morph into needed curriculum faster than you can say amazon dot com. Who says this job doesn’t have bennies? So these can function as picture books for toddlers; add a cute frame and you have a baby shower gift; write a note and you have a classy postcard. Or if you are like me, they are just a delight-filled item that will make you smile. 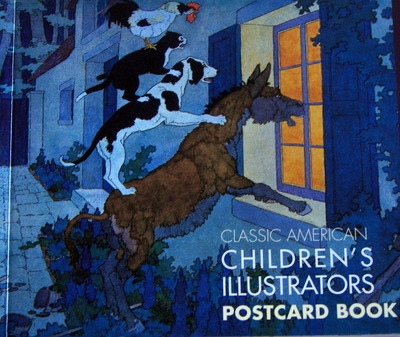 Who are your favorite children’s book illustrators? 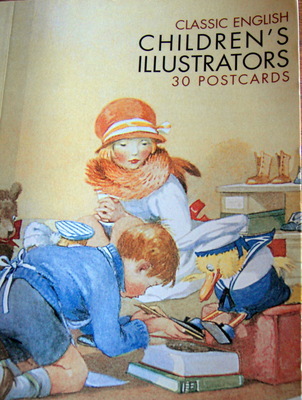 Who comes immediately to mind (but I’m sure I’ve forgotten someone important): Jessie Wilcox Smith, Beatrix Potter, Alan Lee, Kate Greenaway, Tasha Tudor, Garth Williams. I love Eloise Wilkins…and all those that you said! Eric Carle and Rosemary Wells. Sometimes I wish I still had kids young enough to enjoy Wells’ “Max and Ruby” books! Salley MavorWonderful hand-sewn, -knitted, -felted, -stitched illustrations. Beatrix Potter without a doubt! Her animals are so lifelike and I could contemplate her plants and fruits for hours, she truly was a botanist / artist / observer. I think I like Maurice Sendak a lot. Did you have a chance to read Pierre: A Cautionary Tale? @hiddenart – Dana, I was at the library trying to remember what I wanted to pick up. Thanks for the reminder! I haven’t read Pierre yet. @sonskyn – Of course you didn’t make a fool of yourself. But I’m trying to figure out the literal meaning of gemaak. Is that the word for fool?I am delighted and thrilled that you have joined the Wendell Berry fan club. Yay! gemaak is the verb for made – and to literally translate the phrase (which is actually slang – non-existing – one of those common usage slangs) would be to say: did I make (maak) my name (like a piece of) plank? – totally nonsense…. if you want to learn an Afrikaans expression – this is it: all South Africans say ja-nee as a general comment. Ja (soft j) means yes, and nee (as in near without the r) means no…. why we say it, I don’t know…. and another! (since 1994) is Eish… (Origins: Unknown) (pronounced like aysh but also, less often, as ish) – Used to express everything ranging from frustration to surprise to disapproval, but also just everyday acknowledgement of things you can’t change like “Eish, the traffic is bad today”. You will hear it within a few minutes of each and every day! @sonskyn – Thank you for the language lesson. I mean it. I love to learn stuff like this. Gemaak – maak = make, yes! And I’m wondering if ge- is related to all those words beginning with ge: gestation, generation….Other cultures have a yes/no equivalent. Oy vey! comes to mind. I like Eish. Perhaps I could start a trend here…(grin)My South African aunt used the word “Shame” a lot when she visited more twenty years ago. It was the standard response for anything that meant “too bad.” It looks like it’s going to rain today. Shame. Milk is up to $4/gallon. Shame. Most of the meaning was bled out of the word. @magistramater – thank you – i was wondering if i was not too “voor op die wa” (presumptuous) – literally translated: sitting at/on the front of the wagonge – actually indicates past tense: maak = present tense; gemaak = past tense – and it is a soft sound. We have a very simple tense structure – most Afrikaans people struggle immensely with English tenses. It’s like Greek to us (them). And yes, shame is sort of the white version of eish (which originated in Soweto). I’m a big Jane Hissey fan. Helen Cooper is another favorite. @D2saint – Hissey and Cooper are both new to me – or not on my radar screen. Thanks for the tip. I’ll check them out. @LaurieLH – Thanks for the link. Van Allsburg was in the immediate sublayer of my consciousness. But I love his work. Hi Carol, I loved your comment about using homeschooling as an excuse to collect books. I sure did! When my children were small we fell in love with Michael Hague’s illustrations and bought quite a few of his books for our collection. @hopeinbrazil – Michael Hague…of course! I remember my boys saving up to buy some books he had illustrated.